I’ve posted before about keeping a journal in your target language as a way of practicing your writing skills. However, I’ve always struggled to think of things to write about in my journal. This struggle was the inspiration behind the Writing Challenge I did last November. Fortunately, there is another language learning challenge that helps solve this problem: the NVA challenge! What is the NVA challenge? 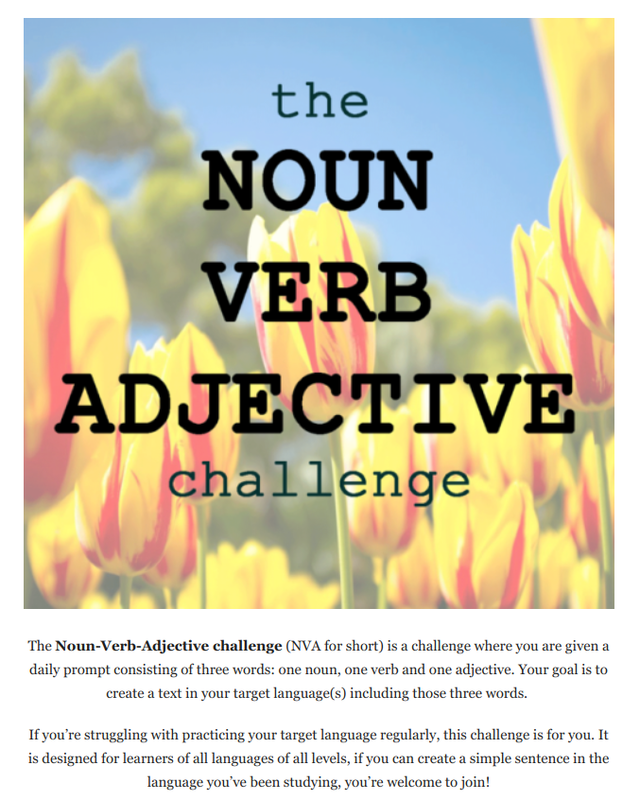 NVA stands for Noun-Verb-Adjective: each day, the challenge provides you with one noun, one verb and one adjective to write a text with. The words are normally of a similar theme or complement each other in some way, which makes it easy to think of at least one sentence. In addition, the words used are words you would commonly use. I’ve been doing the challenge myself for a few weeks and have found it very useful for building a daily writing habit. I find that once I’ve actually written one sentence, it is much easier to write a couple more sentences. Even on days when I am busy, I have been able to write down at least one sentence. It’s become part of my daily routine to write just before I go to bed, which I find quite relaxing! I certainly recommend this writing challenge, as I think it is very accessible no matter what your language level is. You might not find a word in your target language which corresponds directly to English, but that shouldn’t be your main focus. With Japanese, I don’t force myself to use the exact translation of the words given in the challenge. Instead, I normally try to use a word which has a similar meaning. This also has the benefit of focusing your time on actually writing rather than looking up lots of lots of words in the dictionary. You can always get your sentences corrected on language exchange apps and websites such as Hello Talk, HiNative or Lang-8. Hello Talk and HiNative are best suited for sentences or short paragraphs. Lang-8 is better for longer texts (sadly Lang-8 is not accepting new memberships). Find the NVA Challenge on Tumblr, Facebook, Instagram and Habitica. If you use Habitica there is a guild dedicated to the NVA challenge, where others in the community check each other’s sentences too. Today’s post was a short one but I just wanted to write about this great challenge. I hope that it might help some other language learners out! I have a confession to make – I am a serial procrastinator. As much as I love learning Japanese and blogging, there are days when I can’t seem to get round to doing either of them. There are also days when I set quite a lot of time aside to write a blog post for example, but only end up with a half-finished post. Fortunately, the Pomodoro technique has helped to reduce my “bad productivity days” not only with blogging but with language learning too! Pomodoro is the Italian word for ‘tomato’. 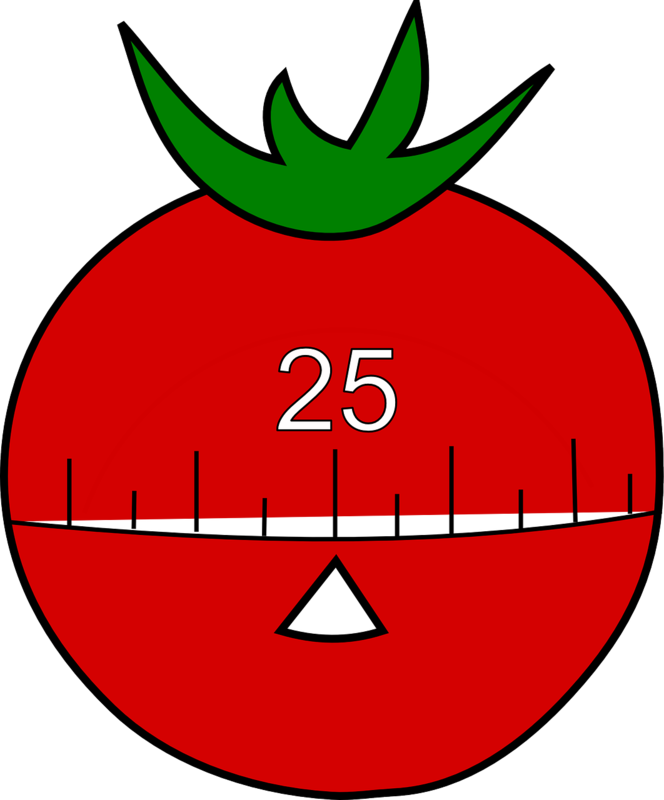 The Pomodoro technique is a reference to those tomato shaped timers used for cooking. It’s easier to get focused and stay focused – 25 minutes is long enough to get things done, but not so long that you get bored. Avoid distractions such as social media (you can check them on your breaks of course!). Short breaks give your brain time to recharge – studying for a long time without breaks is counterproductive. You soon work out how much time you need to dedicate to longer tasks. This is especially good if you have a deadline coming up! Easy to track how time has been spent. This is to make sure that you are spending time working towards the goals that are relevant to you. I had been using the Pomodoro technique for certain tasks that I struggle to motivate myself for such as tidying my room. It was only recently that I realised that it can be easily applied to language learning too. Language learning requires a lot of energy. Sustaining the level of concentration needed to study effectively becomes more difficult over longer study sessions. From my own experience, studying for long periods of time without a proper break usually leads to frustration and burnout. For me, the Pomodoro technique is particularly useful when I am working towards specific goals, such as studying grammar for the JLPT or working on improving my pronunciation. For regular daily study, I have a series of mini goals that I spend 10-15 minutes on (see my Habits over Goals post). Before I start a session, I decide on a specific goal and how I am going to achieve the goal. For example, I will spend 25 minutes reviewing JLPT grammar points from my Kanzen Master textbook. I usually stick to one learning resource only, as referring to more than one usually leads to procrastination. At this point, I also make sure I have my noise-canceling headphones, some water, and any other tools I might need within easy reach. I choose to listen to music during my Pomodoro study sessions. I always used to find music distracting. But I realised that I absolutely cannot listen to music with words, because I usually start singing along! There are some great instrumental videos on Youtube if you search “study music”. My personal favourite things to listen to are Ghibli soundtracks and chilled hip hop. As soon as I start playing my study music, I know it’s time to get focused! Sometimes I extend the Pomodoro length to 30 or 35 minutes if I feel like I am in deep focus, and taking a break after 25 minutes would be counterproductive. If I do this, then I usually reduce the number of Pomodoros accordingly. I make sure that on my breaks that I physically get up and take a short walk, drink some water and grab a snack if I am hungry. Complete 3 or 4 Pomodoros, then take a long break. Did I identify some kanji/ vocabulary that I need to review? Do I need to refer to another resource to clarify my understanding of a grammar point? By doing this, I can make adjustments for my next session that will help me work more effectively. By clicking on the Marinara icon I can jump straight into a Pomodoro session. When each session is done, I get a popup to remind me to take a short or long break depending on how many Pomodoros I have completed. Marinara has a countdown timer, which I find motivating when I feel my concentration slipping – knowing that I only have a couple of minutes to go helps to keep me going! You can adjust the length of the Pomodoros and how the extension alerts you to the end of a Pomodoro if you wish. Marinara also tracks your Pomodoro activity which is quite nice too. When it comes to offline Japanese study sessions, I make use of Pomotodo. By creating an account, you can make to-do lists and track Pomodoros completed; these can then be synced to track your productivity across multiple platforms. Pomotodo is very user-friendly and I love the clean, simple design. The app is free but has a Pro version costing $3.90 per month – I don’t think that the Pro version adds enough value to be worth purchasing it though. Using the Pomodoro technique has confirmed to me that the most important thing is not the length of time spent on a task, but rather how you use the time spent. Defining what goals you have and how you are going to achieve them is also key to using your time effectively. I only wish I had come across this technique before I last took the JLPT! Do you have any time management hacks (for language learning or otherwise)? Let me know in the comments! It’s always exciting when you first begin studying a language. However, as time goes on it is easy to forget how to stay motivated learning Japanese. Learning Japanese is a long journey, with a bit of a steep learning curve. There will be times when we lack the willpower to keep going. I’ve been a little bit unwell recently and after a few days rest I have found it hard to start studying Japanese again. It’s easy to lose sight of what initially drew us to our target language. Whether it be the culture, connecting to your roots, or to watch your favourite TV show without subtitles, there’s so many things that learning another language gives us an opportunity to experience. Whatever it is, watching a video or reading a book is a great way of getting and staying motivated learning Japanese. I personally find watching videos of people who have been able to learn Japanese to a high level really motivate me to keep studying. Kemushichan’s videos are always inspiring for me; my other personal favourites include Dogen and Renehiko. Take some time to think about your language learning goals. What is it that you want to achieve in the future with your target language; is it passing language exams? Holding a conversation with a native speaker? If this is something you haven’t decided on yet, I recommend taking some time to define your goals in detail. When I am lacking in motivation, I remind myself of my short-term and long-term goals and how I will feel being able to achieve them. When it comes to setting short-term goals, you might find the #clearthelist language challenges helps you to formulate and work on the goals more effectively. Here is an example from the amazing Fluent Language from May 2018. Every time you feel yourself making progress, make sure to pat yourself on the back. It is easy to be demotivated when we experience setbacks, but it’s important to acknowledge the positives at the same time. Let’s say you were having a conversation with a native speaker, but it was a little stilted. Whilst the conversation may not have flowed the way you wanted it to, you managed to get your point across and this is always something to celebrate. After all, languages are a form of communication, and being able to communicate is the most important part. With more practice you will learn what sounds more natural. When you want to stay motivated studying Japanese in particular, thinking back to the progress you have made will really help. This is similar to the previous point, but I find comparing what I understand now to what I understood either a few months ago or even when I first started really helps put my progress in perspective. Think about what level you were at the start of the year. It’s quite likely that you have made more progress than you think. It is also a great incentive to keep studying. This is one reason why journalling in a foreign language is a great idea. It is so easy to look back through your journal and see all the new things you have learned! Having taken some time away from studying Japanese, I do tend to think about the words I used to know. In order to combat this, I like to I look back at my old study notes to remind myself of the progress I have made since then. Sometimes a lack of motivation is linked to your current study routine. It is incredibly difficult to stay motivated learning Japanese when you have too many flashcard reviews or grammar points to learn. If motivation has been a consistent problem recently, it might be worth taking a look at your routine. Are there any things that need changing? It might be that your expectations are too high, causing you unnecessary stress. Instead, try setting yourself a series of smaller goals every time you study. My post on simplifying your language routine might give you some ideas on how to do this. Taking a different approach to your learning such as the Pomodoro technique has really helped me to have more effective Japanese study sessions too. The people that we choose to surround ourselves with can have a large impact on our motivation. By surrounding ourselves with people who understand our journey, we can get support and encouragement from them when we are struggling to carry on. This can be in the form of other language learners, teachers and tutors. You might not know any Japanese learners in your area. Don’t worry, because this is where social media can help. I’ve found Twitter and Facebook groups in particular to be a great place to find inspiration, share stories and ask questions when you get stuck. Twitter is super popular in Japan so is especially useful! There are also lots of great blogs out there for that I turn to when I need to stay motivated learning Japanese. For absolute beginners, there’s the 5 Day Japanese Self Introduction Challenge by LearnJapanesePod. Being able to introduce yourself in Japanese is so important (and something you will do a lot when in Japan). I think that this is a great place to start learning the language! Eurolinguiste has a 30 day language challenge which involves reading, writing, speaking and listening. 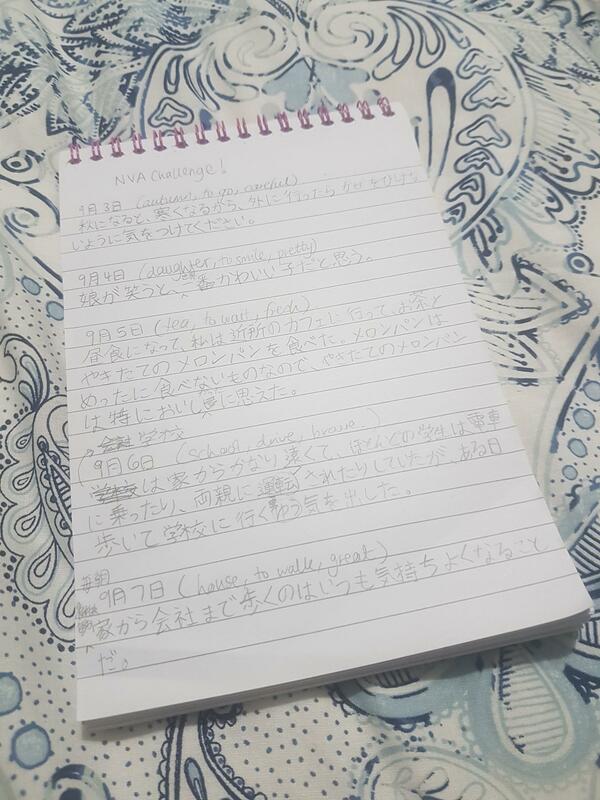 I’ve also done my own 30-day Japanese writing challenge before which really helped motivate me to practice my writing skills. Having a reward to look forward to at the end of the session is important, especially when faced with something that seems particularly daunting. For me, this is usually my kanji flashcard reviews!). I will treat myself to an episode of a TV show or time to play video games. When working towards a bigger goal like the JLPT, I tend to treat myself if I’ve hit my smaller weekly study goals. I hope this post helps if you’ve been finding yourself in a bit of a slump lately. The hardest part of studying is normally just getting started. Somtimes finding enough motivation to simply start is often all you need. The best thing I can recommend is to build helpful language learning habits wherever you can. Have you got any tips or tricks for boosting your motivation? I’d love to hear from you in the comments section! We are now in 2018 and I firstly want to say Happy New Year and 明けましておめでとうございます (明けおめ for short) to everyone who reads the blog! Being the start of the year it is often the time of New Years’ Resolutions (新年の抱負・しんねんのほうふ). I’ve written a bit about working on your language goals previously but wanted to expand on a very important point. Goals are great things to have, but they need to be supported by establishing the right habits which help achieve them. 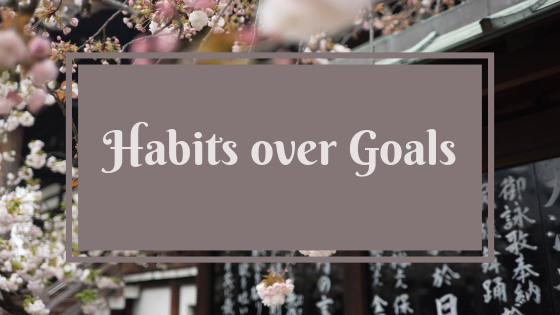 What is the difference between goals and habits? Goals have an endpoint and solely rely on willpower to achieve. Just by setting goals, you can feel a false sense of completion which can be dangerous. Habits, on the other hand, are easier to complete as they are less complex. Normally it takes 30 days for an action to become a habit – after this point, they become even easier to stick to. Let’s say that your goal is to complete a 5km run (and you do not run at all currently). Your initial focus should be on making time to run 2-3 times a week. If your goal is to pass the JLPT N5 in December, then focus on studying Japanese for 30 mins a day. See my post on getting your language 5-a-day for ideas! Focusing on habits means that there is a possibility we exceed our goals. We might end up running 10km instead of 5km. We might be ready for JLPT N4 instead of JLPT N5 by the end of the year. The key is to make the habit as simple as possible. If you were to set the task of reading one page of a Japanese book every day, you would probably find yourself reading more than this most days. This is because (hopefully) you really enjoy the book you are reading! Whether you meet or exceed your task for the day, this sense of achievement helps you stay motivated towards your end goal. As you may know, November is National Novel Writing Month (NaNoWriMo). It is aimed at anyone who has ever wanted to write a novel who set about writing a 50,000-word novel by 11:59pm on 30th November. I think that whether you reach your target or not, the sense of community that surrounds the event each year is a great way to get motivated in November and beyond – read more about it here. I was reminded about NaNoWriMo recently and this got me thinking about writing in Japanese. I don’t think I am up to the task of writing a full-length novel in Japanese, let alone English yet, but I wanted to think of ways to write about a bigger variety of things in Japanese. I currently write in my language journal several times a week (I try to write every day, but there are days when I don’t get round to it). I do want to write something every day, but I often find I end up writing about the same sorts of things such as going to work or what I ate for dinner, which gets boring quickly. So I want to use November to get myself (and anyone else who is interested) writing every day with the November Writing Challenges! On this blog I intend to provide writing prompts for each day of November. Depending on your level, some days will be trickier than others, but I hope you can give at least a couple a try. At the end of the month, I’m hoping I’ve managed to write something a bit more interesting, and continue to write creatively going forward. If you’d like to get involved let me know in the comments – we can do this! Podcasts are great for language learning because you can use them to get used to the rhythm and sounds of a language and are often educational at the same time. I’ve recommended a couple of podcasts on the blog before but I thought that it would be best to put together a post that explains why I love using them for language learning. 1) Podcasts for immersion. These are the podcasts I like to play as background noise while I am doing something else. I try to pick up as much as possible and may listen to the podcast more than once, but I do not worry too much if I come across something that I do not quite understand. I download the NHK daily news bulletins for this purpose, but I normally catch up with current affairs in English first before listening to give me an idea of what might come up in each bulletin. Example podcasts: NHK daily news (there are morning, noon and evening podcasts every day), ひいきびいき (two presenters talk about a given topic each week – the podcasts can be lengthy but I find the episodes on topics that interest me very entertaining!). 2) Podcasts for study. These are the ones that I will study to make sense everything that I hear. Depending on what your language level is, this may include some that mix English and Japanese. I might use a bilingual podcast to go over a grammar point or review some vocabulary. I also listen to podcasts entirely in Japanese, but unlike the podcasts in the first category, I am using them to study more actively. For example, I will review the podcast together with the transcript (if available) and look up the words and phrases I didn’t understand. Learn about Japanese culture. Culture is so closely intertwined with Japanese that knowledge of culture greatly informs your knowledge of the language and vice versa. For example, I am trying to improve my knowledge of Japanese history and so I have started listening to the Samurai Archives Japanese History Podcast. Boost my language learning motivation. Sometimes finding the motivation to study is difficult. For times like these, I listen to a couple of podcasts that relate to motivation and language learning in more general terms. One of my favourites is the SpongeMind podcast (I recommend this in particular for Korean learners, as each episode is available in English and Korean), where the hosts Jeremy and Jonson discuss different aspects of language learning in each episode and always impart useful advice. What do you use to listen to podcasts? I like to use Podcast Republic (available on the Google Play store) to listen to my podcasts as it is free and very user-friendly. By clicking ‘Add Podcast’ and then searching for the podcast name, you can easily subscribe and download podcast episodes for all of the podcasts I have mentioned in this post. Alternatively, you can get the podcasts by going through the websites linked above and downloading them manually onto any device – you can then listen to these through specialised podcast apps such as Podcast Republic or any other music playing app you already have. As I have entirely Android devices I do not often use iTunes, but iTunes is a great source for podcasts – reading the reviews can give you a good idea of whether you’d enjoy the podcast before you listen to it. What I find particularly useful about podcast apps like the one I use is that you can skip forward or backwards by 15 secs in order to listen to a key piece of info again or for shadowing. Which podcasts do you listen to? Please let me know in the comments (especially if they relate to Japan, Japanese or language learning!). September means going back to school/ work/ university after the summer holidays. It might be that you’ve taken a break from language learning too. Sometimes with learning a language, you can be incredibly motivated to begin with, but then life gets in the way and by the time you remember about your plan to learn Japanese you feel like you’ve forgotten everything! I myself have taken breaks away from learning Japanese – here’s what I do to ease myself back into the language. Writing: Writing in my journal helps me to use vocab and grammar I may have forgotten – I tend to use this as the basis for my grammar study, ie. I will go back over a grammar point if I’m not confident in using it anymore (especially if I’m not working towards the JLPT). Listening: Listening to podcasts helps me set my brain into ‘Japanese mode’. You might find that watching a TV show or film helps with this too. Reading: I’m using Anki to help get my vocab and kanji skills back on track, together with reading articles on NHK News Web Easy. Speaking: Speaking is probably the hardest to practice when coming back from a break. I suggest building your confidence by talking to Japanese friends about topics you are familiar with at first – focus on what you can say rather than what you cannot say. • Don’t be afraid to go over ‘easy’ material. • If there’s something that doesn’t make sense in the resource you’re using, try to find an explanation somewhere else. • Make sure you have a goal to work towards. Having a goal, however small, will remind you why you decided to study the language in the first place. Remember, language learning is much more about the journey itself than the destination – having a couple of stops along the way is nothing to be ashamed of.